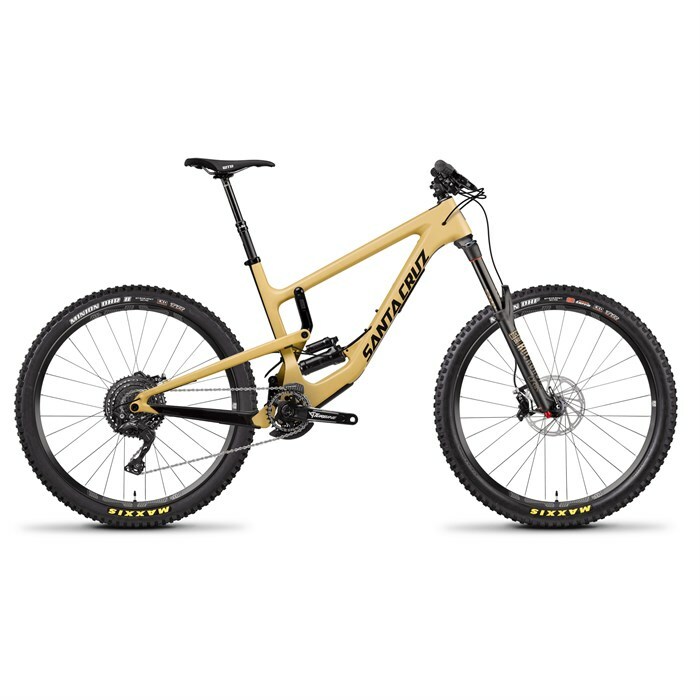 Bigger, badder, and more downhill savvy than ever before, the new Santa Cruz Bicycles Nomad 4 C XE Complete Mountain Bike boasts a fully redesigned geometry and a progressive lower-link shock design. Complementing the raked out 65° head angle and VPP® suspension, this build features plush RockShox suspension that gives it the smooth sailing feel of a DH rig while an efficient Shimano XT 1x11 drivetrain and lightweight carbon frame work to retain pedal-ability on the ups. If you're a dirt cowboy who loves to take the spicy line and never shies away from burly features (whether natural or man-made), then the aggressively reworked Santa Cruz Nomad 4 C XE Complete Mountain Bike is the horse you oughta kick a leg over. RockShox Super Deluxe RCT Shock  Solid Threshold adjustment for pedaling performance, compression adjustment to fine tune the ride to any trail and condition, and the proven performance of RockShox’s revolutionary Super Deluxe rear shock in a package that’s ready to tackle any challenge. Progressive Lower-Link Shock Configuration  Similar to that of Santa Cruz's V10 downhill bike, this configuration creates a shock rate that's supportive and progressive -- an ideal scenario for rough terrain. High & Low Geometry Settings via Flip Chip in Link  The high setting sets the bike up for added versatility, while the low setting slacks it out to near-DH levels. In either setting, the Nomad's longer reach equates to added stability. RockShox Lyrik RCT3  The new Lyrik gets the new Charger 2 damper, which reduces overall weight, increases bump-sensitivity and traction, and reduces the force needed to turn knobs and lock in the best setting for the terrain. And since today’s enduro riders demand ultimate pedaling efficiency, the new Lyrik is remote compatible, which allows for on-the-fly compression control. Shimano XT Shifter  Ergonomically designed for prolonged enjoyment. Simple, adaptable cockpit. Race Face Turbine Crankset  The Turbine continues setting the benchmark for performance aluminum cranks and cements the Turbine legacy. Featuring the proven Race Face Cinch System interface, the Turbine is an incredibly light and stiff performance crankset for today's modern XC, trail, and all-mountain rider. e*thirteen TRS Race 11-Speed 9-46T Cassette  The 9-46T range allows you to climb further up the mountain without sacrificing top end gearing. Clean steeper climbs and blast the descents! Shimano XT Rear Derailleur  Rider tuned for sharp and silky shifts.